Fasting helps you enjoy a super-charged, healthy, happy long life. Fasting is the key to internal purification. Remember that all those inorganic chemicals must be passed out of your body or they can cause great damage. If the body's Vital Force drops too low then it can't force these inorganic chemicals through your eliminative systems. Then they remain in the body and can cause grave health damage in the future! If we are to get these poisons out of our bodies we must fast. By fasting we give our bodies a physiological rest. This rest builds Vital Force. The more Vital Force we have, the more toxins are going to be eliminated from the body to help keep it clean, pure and healthy. In our opinion, the greatest discovery by modern man is the method to rejuvenate himself physically, mentally and spiritually by fasting. Man can create a quality of agelessness and with fasting, can prevent premature ageing and a premature death! The dread of "growing old" and becoming a burden to himself and others is one of man's greatest fears. The fear of becoming sick, senile, helpless and unable to care for one's self is rooted deep in every thinking person's mind. 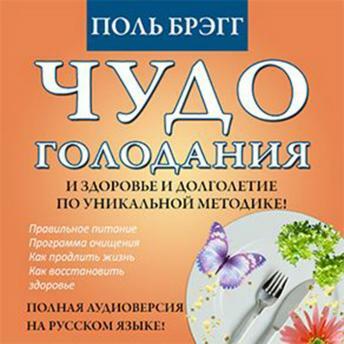 With the complete knowledge of fasting and The Bragg Healthy Lifestyle, as outlined in this audiobook, you can banish all your fears of premature ageing! With a 24 hour complete water fast weekly setting aside 52 days and four 7 to 10 day fasts a year for body purification you can keep the toxins removed and flush the rust and crystals from your moveable joints and muscles. You must bear in mind that it is the toxic debris and wastes of metabolism (from the biological process of converting food into living matter and the matter into energy) that bring on many physical ailments and premature ageing. Fasting the Key to Super Energy Fasting is the key which unlocks Mother Nature's storehouse of energy. It reaches every cell in the body, the inner organs and generates the Life Forces. No one can do it for you! It's a personal duty that only you can perform. No one can eat for you. And I believe that 99% of all human suffering is caused by wrong and unnatural eating. The efficiency of any machine depends upon the quality and amount of fuel for generating power it is given. And that goes double for the human machine!